Are you feeling walled in at home? Do you long for more open space and light where the kitchen flows naturally into the dining room and garden? 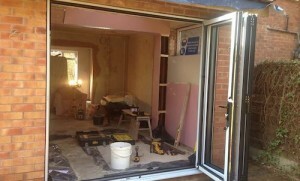 At Trafford Builders we can extend your home seamlessly. It’s all very practical and straight forward. We’ll be knocking down walls. And there’ll be noise and mess for a while. But afterwards you’ll be so glad you invested in the upgrade. We enjoy working with structural engineers and architects to blend structural integrity with aesthetics and a dash of ergonomics. 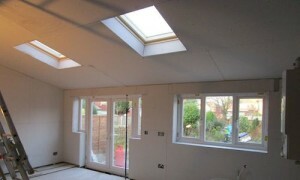 You’ll probably need some Velux roof windows, rolled steel joists to reinforce some walls and widened windows spaces. We’ll be matching the new bricks with the old, the new floorboards or flooring with the old, and making sure the electrics are hidden and fittings are consistent through the various zones of your home. We can oversee the building works on your home to ensure the tradesmen work in sync for a smooth transition to your fabulous new living space. We love nothing better than winching the best part of a tonne of steel into place using a pair of Genie winches – if that’s what it takes. All this to make your home a heaven of light and space that will be the envy of your neighbours. There’s nothing more therapeutic than knocking down walls that are blocking the sunlight from your life. We do this safely and carefully – following HSE best practice. And our award-winning brickie will match the new extension bricks to the old. We’ll ensure floors, electrics, light fittings and the like look sleek across your new and old sections. And as Gold-card carrying plasterers, of course your walls will be skimmed to sleek perfection. We’ve worked in and around the Trafford Borough for over 10 years, building up a reputation that we’re extremely proud of. Our reputation means alot to all the Trafford builders team. We’re always working hard for our customers, making sure that they are as satisfied with the end result as we are. We created this page specifically for those who are looking for a local building company that offers bricklaying and brickwork services in to residents in the Trafford borough.